The weather did not cooperate last night, so the Mets’ game I had tickets for got rained out. I will have to exchange those tickets for a game next April since I can’t make it to today’s doubleheader. 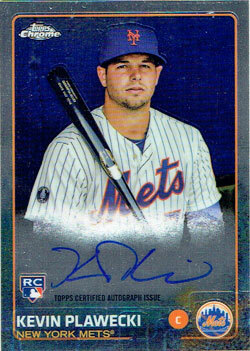 But on the bright side, I was able to add a couple of new cards to my Mets autograph collection via eBay purchases. 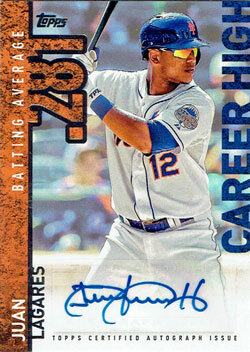 Juan Lagares had certified autographs in a few different Topps sets this year following his gold glove season in 2014. This one, a “Career High” insert from Topps Series 1, is probably my least favorite … but the price was right. And Lagares has a nice autograph. Hopefully he will find a way to contribute during the playoffs and have a more productive year in 2016. Kevin Plawecki started 65 games for the Mets in 2015, more than the team’s number one catcher Travis d’Arnaud. And he had a solid season for a rookie catcher. Plawecki’s rookie autograph card from this year’s Topps Chrome was another nice pickup for a low price…probably because it’s not of much interest to many people other than Mets fans. By my latest count, I have autographed baseball cards for 913 of the 1,007 players in Mets history.